Communities Minister Andrew Stunnell has praised an Islamic community’s services to humanity on the occasion of the launch of a new blood donation drive at London’soldest purpose-built mosque. The Ahmadiyya Muslim Community is organising the blood donations as part of the community’s commitment to be of service to Queen and country. 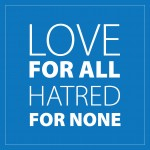 It is being launched on Thursday 2 February 2012 at the Fazl Mosque (also known as the London Mosque) in Southfields, Putney. The Ahmadiyya Muslim Community -one of the first Muslim communities in Britain- believes that giving blood and saving lives is a potent symbol of a life-affirming faith. Members of the community have been involved in donating blood to blood banks, and blood centres have been established at a number of mosques across the country. This includes western Europe’s biggest mosque in Morden and other Ahmadiyya Muslim mosques in Birmingham, east London, Manchester and Glasgow. The blood donations sessions are open to all, and have proved popular with local residents. “We have been working with the National Blood Service for the past decade and since 2003 a number of our centres have become permanent venues as there is a shortage of south Asian donors. In London our permanent venues are Fazl Mosque in Putney, Baitul Futuh Mosque in Morden, and Baitul Ahad Mosque in Newham. In the Midlands the Darul Barakat Mosque is a permanent fixture whilst in the North we operate Masjid Al Mahdi in Bradford, Darul Aman Mosque in Manchester and Baitur Rehman Mosque Glasgow as blood donation centres. More than 15 sessions are held throughout the year as part of our effort to save lives. The busiest sessions are in London with the Fazl Mosque being oversubscribed and at least 40% of donors being from outside the Ahmadiyya Muslim Community. We are working with the NBS to establish further centres and, apart from this, our youth take part in external sessions. Giving blood helps to save lives, and in this respect it is an act of faith. The giving of blood is symbolic of providing lifeblood for humanity and Ahmadi Muslims are committed to the service and benefit of mankind.